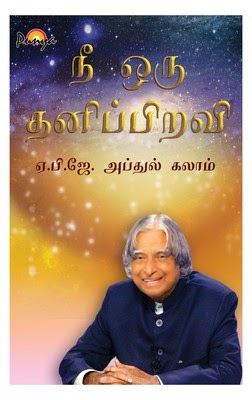 Nee Oru Thanipiravi - A life Changing Book, The thoughts of A. P. J. Abdul Kalam, in You Are Unique, with their heartfelt sincerity, chiselled logic and experienced intuition are amazing lamps on the path of life, giving strength to seek one's Unique Self. This book draws an unforgettable blue print of success for all. One lesson that shimmers from every page of this book is hope. Whether in failure or in success, there is always a clear vision of future. In human life as well as in the corporate world, the value of vision, leading to planning, followed by action should not be underestimated. The success smiles on those who dream and act. A message of spirituality, honesty, being unselfish and the value of giving emerges from these pages as from his life. The world has changed and there is a need for awakening together the head and the heart. While poems touch the heart and leave a deep impression, his prose leads you to think how to go beyond the rock walls of conditioning, perceptions and prejudices to achieve success and fulfilment. Clearly presented thoughts, in You Are Unique, become our inspiration and constant companion, flashing 'upon the inward eye' at our decision making, vision creating as well as ordinary moments of life. Visually appealing, illuminating, dotted with his simple and charming experiences of life, you will love to read this book again and again. Dr. APJ Abdul Kalam He is a mystic as well as a Scientist. He not only looks at the discoveries and inventions but also at the minds that worked on these inventions and encourages others to be like them. He has a great faith in human potential and wants everyone to seek that uniqueness in oneself.